We put the new-for-2018 PSE Xpedite to the test. In the past, if you’ve avoided very fast bows because they aren’t pleasant to shoot, then you need to give this bow a test drive. “I like bows that perform,” PSE founder Pete Shepley told me more years ago than I like to remember. By “bows that perform,” of course, he meant “fast bows.” PSE has long been known for “bows that perform,” but as one of the world’s largest (if not the largest) manufacturers of archery equipment, PSE’s lineup has since those early days expanded to include multiple series of bows designed to appeal to the individual styles and preferences of any shooter. Among the many new bows for 2018, the Xpedite is described as the aluminum flagship of PSE’s new Vapor Series. Some bowmakers have flagship bows; PSE has flagships in numerous series, not to mention “aluminum flagships” and “carbon flagships.” At 352 or 360 fps, depending on which of two modules is used, the Xpedite is a speed bow by any standard. For that reason it’s often compared to another PSE speed bow, the aptly named Full Throttle, which boasted an IBO speed of 370 fps. While it retains some design elements of previous models, the Xpedite does boast some brand-new features in addition to the bridged riser design. The adjustable cable guard with roller guides is one. The new cable guard is flexible, though somewhat less so than has previously been the case. The LiveWire strings and cables were introduced last year, but for 2018 they’re color coordinated with the bow. The grip is redesigned as well, and following what appears to be an industry trend is very close to no grip at all. It’s comfortably ergonomic, though, and features a groove down the front side of the riser, which some shooters say assists them in maintaining a consistent shooting form. (In which case they have very small hands or a very unorthodox grip.) Dampeners integrated into the riser, along with dampeners between the split limbs, are retained. Also retained: PSE’s fit and finish, which are flawless. No machine marks, no burrs, no peeling finish anywhere. The finish easily passed the scratch test, and the logos are crisp and pop out nicely from the background, which in the case of the test bow was Mossy Oak Country. The bow comes standard with the HL (high letoff, presumably) module, and I adjusted to maximum letoff. Draw weight out of the box was maxed out at a little over 70 pounds, so I backed it down. The limb bolts were snug but turned very smoothly, which always suggests to me tight tolerances. There were no issues setting up or tuning the bow, although the manual refers to an arrow alignment groove or line on the shelf for proper horizontal alignment of the rest, and I never located this on the test bow. Instead I eyeballed alignment with the riser and string, and made a few minor adjustments to paper tune. As I’ve mentioned before, I like multiple sight-mounting holes, which this bow has. Bows inevitably lean toward the speed side or the sweet-shooting side of the ledger, with many attempting to find the sweet spot where respectable speed meets comfortable shooting. One of the challenges is that, while speed can be objectively measured, comfort is both relative and somewhat subjective. To a shooter accustomed to pulling 70 pounds, a 50-pound bow is likely to feel smooth despite a draw force curve that suggests otherwise. Where does the Xpedite fit into this equation? The draw is sometimes described as a little stiff but nonetheless smooth. I found it quite smooth. The valley is deep at the higher letoff but still comfortably so at a lower letoff. At the shot, the bow pops forward slightly in the hand — a sensation many shooters, myself included, tend to like. Vibration is minimal, and there is nothing that could be described as hand shock. The skinny brace height might be an issue for some shooters. I don’t believe that a skinny brace height makes a bow less forgiving and have not seen any evidence that that is the case, but shooters with an unorthodox or inconsistent shooting form, or slightly unusual anatomy, might find it to be a problem. It is easy to say that a given bow is surprisingly smooth given its speed. This bow is smoother than that. I’d enjoy hunting anything, anywhere, any time with this bow. There are smoother-shooting bows on the market, but this is a bow I would recommend to anyone who has avoided very fast bows on the grounds that they are not pleasant shooting. Each bow is carefully inspected out of the box for fit and finish and for any visible defects in workmanship. Axle-to-axle length, brace height, mass weight and draw length are measured and compared with stated specs. Minor discrepancies in draw length are corrected or noted. 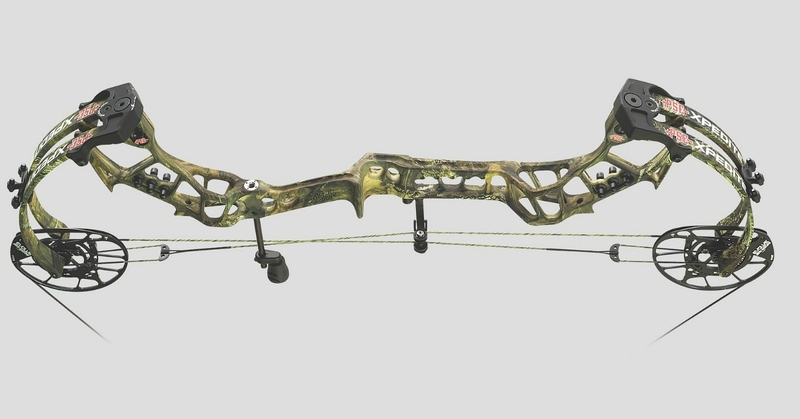 A QAD UltraRest is installed, and each bow is equipped with a TruGlo sight, a TruGlo stabilizer, a G5 ¼-inch Metapeep and a D-loop. Test arrows are Carbon Express Maxima Red arrows at weights of 385 and 440 grains, fletched with Bohning Blazer vanes and fitted with QAD Tune-A-Nocks. Peak draw weight is established, and draw force curves, along with letoff, are determined using an Easton Bow Force Mapping System. All bows are pressed on a Buckeye Archery Solutions Bow-A-Constrictor press.